Browse through a large number of Haunted Houses and other Haunted Places in North Carolina. Each year we bring you the scariest places in North Carolina and this year is no different. So get out and find a Haunted Place or some other Haunted House in North Carolina and get your scare on! North Carolina has many scary attractions to keep you terrorized. 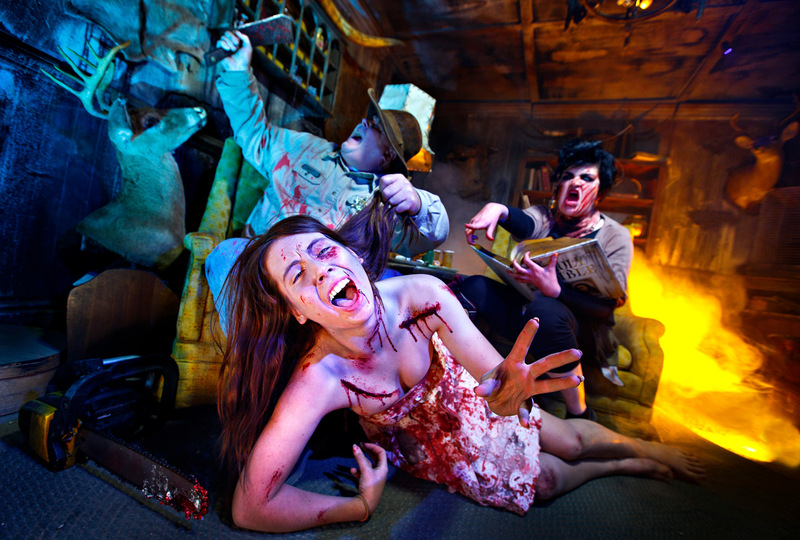 Greensboro haunted house was reviewed in Haunted Attraction Magazine as a Must See in 2014. Travel to Greensboro for the pure horror of Woods of Terror on Church Street. Blackbeards Revenge brings all the pirates to the 3D haunted ship. Travel to High Point for Kersey Valley Spookywoods. North Carolina, one of the original thirteen (13) colonies, is rich is history and bloody war battles. From a war that lasted two years with the Native Americans and the European Settlers, The Tuscarora War ended with many lost souls wandering in purgatory. North Carolina, a state started with about thirty (30) different Native American tribes: Cherokee, Tuscarora, Catawba, Croatans, and many more were scattered across this beautiful state of North Carolina before all the bloody battles for land left death, destruction, dismemberment, and tortured behind. Only eight tribes are recognized in North Carolina today. Even Blackbeard, the English pirate, perished off the North Carolina coast in a disgusting disrespectful bloody manner. Blackbeard, shot multiple times, was dismembered into many pieces, and his bloodied head suspended from the front bow of the ship so a reward could be collected. Blackbeard's spirit still looking for vengeance for his death, roams the portals that open from the depths of the under-world looking to expel his intense anger that builds throughout the year. All these spirits converged with all the spirits of the soldiers who died during the Revolutionary War. The Battle of Moore's Creek lasted five (5) minutes and left about seventy (70) soldiers dead. North Carolina's death totals rose significantly during the Civil War with over forty-thousand more dead. Souls left behind to complete missions, lost between life and death now roam North Carolina. These souls converged in the many haunted houses, haunted mazes, haunted hayrides, ghost tours, paranormal activity, attractions and more. Summoned by the Halloween season, draws them to the portals that open due to the intense negative energy they need to expel. This intense negative energy they expel, helps the living keep them at bay for the remainder of the year. Unfortunately, they must return to do their bidding as part of their mission in purgatory. North Carolina is a major portal to the depths of the under-world. Demons and messengers of the under-lord return to experiment on the living. Hidden chambers and dungeons are opened under the pure evil and negative energy of the spirits who are unaware of their untimely death. North Carolina is home to many haunted attractions that are well known in the haunt world. These attractions have been selected as one of America's Best Haunts, on the list of 25 Must See Haunts from the Haunted Attraction Magazine, and on many local television and radio stations. Visit the haunted world of twisted and deranged haunted houses, spooky woods, attractions, mountains, mazes, estates, trains, trails, parks, manors, fields, graveyards, camps and more. Find the most innovative animatronics, cutting edge technology, scary monsters, creepy zombies, clowns, demented demons, creatures from the depths of the under-world, wandering souls, and bring your nightmares to life right here in North Carolina. When you are searching for haunted houses online, North Carolina is full of restless souls. Eddie McLaurin knows how to scare people. He knows so well that you can say he’s the Stanislavski of acting training in haunted houses. He has a method, and his method works. He says it is rare that a young performer, no matter how experienced of an actor, knows how to scare people. But Eddie will teach them. Eddie started Woods of Terror, a mega-haunt outside of Greensboro, North Carolina “22 frightening years ago.” In that time it has become a veritable horror theme park. With 30 acres of woodlands, a staff of 175 and over 100 actors all housing 9 attractions and a midway called Halloween Town, this haunted adventure rivals the biggest and best in the country. Quite simply, this is not just a haunted house, but home to multiple attractions. It takes about 90 minutes to complete. But the engine that makes Woods of Terror run is the actors. “I like the production part of [a haunted house], and we do have movie level production values, but my focus is on the acting,” says Eddie. “My bread and butter are startles. I’m very good at finding different ways to startle people.” He adds, “keep it simple, stupid. It’s all about the startles”. Simplicity is true for the sets as well “I have spent tens of thousands of dollars on large facades and what have you, and people don’t even pay attention. Once I bought an extremely expensive piece of scenery and people leaving were like ‘that was alright’, but then I threw an old school bus in the middle of the cornfield that cost me $500 and that’s all anyone could talk about.” He emphasizes it’s what it is, not how much it is. Eddie puts his actors through rigorous actor training. Full of acronyms and motivational speeches, He has his monsters ready for all situations. He has created a scare sequence that always needs to be at the core of the actor’s process. It’s quite simple, really, and seems elementary to the seasoned haunter. It’s a four-pronged checklist: Hide, Startle, Stalk, Hide. Of course the devil is in the details. They each have lines, and activities they have to accomplish as well, but as long as they remember hide, startle, stalk, hide then they will never forget how to scare. And the trick of this sequence is that it is not always the same. Sometime the sequence rotates so that the back of the group starts first, and then the front and then the middle. As obvious as it might seem, Eddie reminds us, “to keep it simple, stupid”. There are also variations on the theme. He says the best startles are when “someone is hiding in plain sight.” This means that you are looking straight at it, but you don’t realize that’s what you are looking for until it’s lunging at you. He compares it to the scene where E.T. is hiding in the closet dressed as a doll, but the mother doesn’t register what she is seeing because, well, she wasn’t looking for an alien. It works like that, but with zombies, vampires, killer clowns and psychopaths. Clearly his formula has worked. They average over 30,000 visitors a season with 75% of the audience being repeat customers. In addition to the photo-realistic set-pieces and large scale installations, he takes advantage of the natural production values the great outdoors naturally allows him. Most of the haunt is outdoors, although parts if it still can run despite inclement weather. It thrives, however, on settings that promotes realistic fall nights, with natural sounds, smells and scenery- creating a sense of realism. Woods of Terror is consistently named one of the best haunts in America. Once you enter you never stop. You traverse from one attraction to the next via a black-out maze. The first of 9 attractions is called Infestation. This event starts with 16 aquariums full of snakes and other creepy crawlies, but then turns into an all-out sensory assault playing on a myriad of phobias: bugs, spiders, snakes, claustrophobia and darkness. Next is Nightstalkers, a larger than usual corn maze. It’s harvest time and you’re the crop! This leads to Industrial Nightmare where the previous employees are now inhabiting the defunct power plant ready to feast on the visitors. Next up is Awakening, which I do not believe is based on the Oliver Sacks book and subsequent movie starring Robert DeNiro, unless that book was about a graveyard ransacked with zombies with a penchant for braaaaaiiiins, but I don’t think it was. In Chaos 3D you wear 3D glasses and go through the darkness where 3D paint brings the walls alive. Psychotic clowns abound. That leads to The Blood House where beautiful vampires are thirsting for your blood. 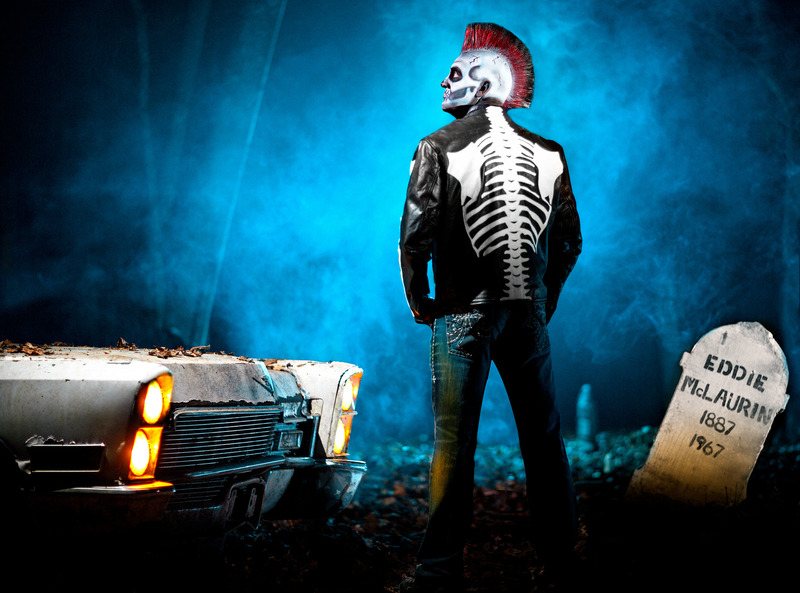 And if you want something different from your haunt, then WOT is the place to be. How many haunts have a Gold Mine haunted by evil, greedy dead miners? The Horrorwood Cinema Grande is a very impressive recreation of an old-timey abandoned theater where you are the show, experience terror first hand! Finally, there’s Blackbeard’s Revenge. A pirate ship that moves, unleashed from its final resting place, don’t steal the rum or treasures… note: There will be no Jack Sparrow or pirates with squid beards. After all is said and done, you get to enjoy the Halloween Town midway where there are performances, a gift shop, concession stand and horror memorabilia museum. Just like a real theme park. Some monsters will also pop out from time to time to startle you. You know, just to keep it simple, stupid.